In her recent article on Forbes, Pia Silva talks about building her business Brandup, a digital marketing agency. In the early days of the agency, they charged $3,000 per client. Today, they charge $15,000 per client. The agency went from charging $3,000 to $15,000 within a few years because they demonstrated their expertise instead of just saying they are experts in their niche. If you’re serious about landing your ideal clients on a consistent basis, you should become a respected expert in your niche. A blog is different from a website. A blog is frequently updated. A website is not. You can add new articles to a blog several times a day. Blogging positions you as an industry leader. Blogging helps you demonstrate your expertise to potential clients and gain their trust. Blogging is another form of content marketing. Content marketing costs 62% less than traditional marketing and generates 3x more leads. Seventy percent of customers would learn about your business through the articles posted on your blog than adverts. Publish high-quality articles on your blog on a consistent basis, and you’ll be rewarded with lots of customers. High-quality blog posts are hard to create, but they are always worth the time and effort. A great blog post would generate traffic for many months and years to come. Caz Makepeace of the yTravel Blog revealed that many of their 3-year-old posts continue to generate 2,000 – 3,000 views a month. And they continue to receive emails of gratitude from people who found it helpful. Through blogging, Caz and Craig Makepeace have become one of the most respected experts in the travel niche. To get the real benefit of blogging, you should publish 16 times a month, according to a study by HubSpot. Bloggers that publish 16 times receive 3.5x more traffic than their competitors who publish less content per month. Blogging on a regular basis will help you generate more traffic to your brand. More traffic means more leads. And more leads means more customers. Whether your business is a B2C or a B2B, blogging can help you drive lots of traffic to it. Through your blog, you can collect visitors email addresses. For example, Kim Garst is a thought leader in the social media space. She collects emails on her blog. Email is the most reliable way to communicate with prospects who visited your blog. Blogging is publishing content on your blog. Guest blogging is publishing content on established blogs in your niche or sub-niches. When you start your blog, you’ll have zero people reading it. Instead of publishing on your blog and hoping someone sees it in the early days, you should start guest blogging to drive traffic to your blog. For example, Bill Widmer uses guest blogging to drive traffic back to his blog. Here’s one of his Google Analytics screenshots for the same day a guest post was published on a high-authority blog. Guest blogging will help you build yourself up as an authority in your niche. No matter who you are, or the kind of business you run, you can leverage guest blogging to become a respected expert. For example, Steve Elville, a principal at Elville and Associates, an estate planning and elder law firm in Maryland, regularly publish guest posts. Here’s one of his guest posts on WBJC’s website, Maryland’s classical music station. When guest blogging, ensure that you get, at least, a backlink to your blog or site from the guest post. Backlinks coming from guest posts will help your blog rank higher in search engines. Guest posting is so effective that many SEO agencies and digital marketers say that they use it in their link building campaigns. Guest blogging will drive links to your blog. That means higher rankings in search engines. Consumers are more equipped with more knowledge than ever. If there’s anything they want to know, a simple Google search will reveal everything to them. So, they don’t need to talk to an expert to understand common topics. Or choose a Niche in which you are most interested. You need more than just knowledge to become a respectable individual in your niche. With passion, you’ll not only create content on a consistent basis, but you’ll also innovate. Your ability to innovate is the key. Constant innovation gives you a competitive advantage over other thought leaders in your niche. To maintain your status as a leader, you have to introduce new or better content on a regular basis. Many people know what you do. They are not respected because they lack passion for what they know. They lack the passion for experimenting new things. For example, Neil Patel is one of the most respected experts in the digital marketing niche. Patel continually tries new things on his blogs and in his marketing. He spent $57,000 trying different marketing tactics on Instagram and wrote about it on his blog. He challenged himself to build a blog that makes $100,000 within 12 months without using his name and the network he has built over the years. He also wrote a case study of how spending $162,301.42 on clothes made him $692,500. Neil Patel is always experimenting with new strategies. That is why he’s one of the most respected digital marketing experts. This requires more than just knowing what you do. You also have to be passionate about it. When you have a passion for what you do, the money will follow. One of the biggest secrets of Amazon is learning about their customers and various marketing tactics they can use to win a larger market share. Amazon CEO, Jeff Bezos is obsessed with learning. If you’re not always learning new things, it means you’re not growing. And you can’t be seen as a respected expert when you’re not growing. As an expert, you should always be steps ahead of your followers. So, develop a growth mindset. That is how you grow to become an unstoppable expert in any niche. Most people are distracted right now. They will rather do other things than learning. The knowledge you have right now makes you valuable. But you can be even more valuable if you are willing to increase your knowledge. By starting a blog, guest blogging on a regular basis, having a passion for what you do and obsessed with learning, you’ll become a respected expert in your niche in no time. 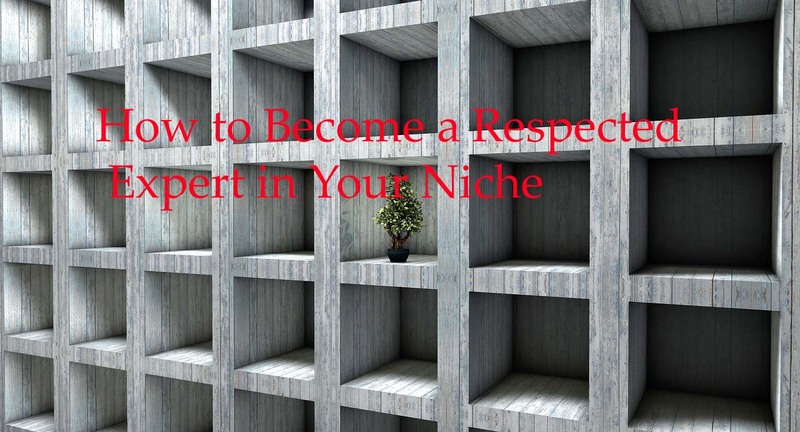 What other ways have you seen people become respected experts in their niches? Amazing article for a newcomer like me certainly gained a lot of inputs from it. Surely was helpful and a guiding force for me. Looking forward to implementing your advice and hope to grow slowly but surely. An informative post. Will definitely help a newbie like me Thanks a ton.